Charity ball team members Katie Alvis, Lisa Sellers, Clare Sissons, Wendy Shirley, Lesley Mercer, Justine Sangwin and Davina Harper at the unveiling. Pocklington now has another public defibrillator thanks to the magnificent efforts earlier in the year of a fundraising team from Pocklington RUFC. The PRUFC Feathers and Fools charity ball for 250 guests raised a remarkable £16,000. 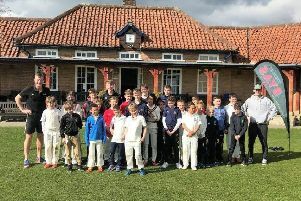 The monies went to the rugby club’s Kickstart Kilnwick project, the U12s team, Hull and East Yorkshire Mind and the Yorkshire Ambulance Service Charitable Fund. As part of their fund raising efforts a defibrillator was purchased which has now been mounted to the clubhouse external wall on Burnby Lane and registered with YAS for all members of the public to use in the event of an emergency. Members of the charity ball team recently attended the official unveiling of the defibrillator at the club.